Of course, I turned to my trusty facebook friends to inquire about the best mattress options between Casper, Lull, Purple, Avocado, and so on. I picked the most “sustainable” mattress brands I knew of and went from there. The responses were actually a pleasant surprise; I received a lot of suggestions I hadn’t considered, and one of my friends even mentioned a LATEX mattress. I honestly thought he was messing with me at first, making some guy-joke about that I didn’t want to even question… But I decided to take a chance and google it. As it turns out, latex mattresses ARE a thing. And they’re actually way more sustainable, comfortable, and durable! I went C R A Z Y researching all about Latex Mattresses (#type5 amiright): What are they? How have I never heard of latex mattresses? Why is no one raving about this? Just as the name says, a latex mattress is similar to a “foam” mattress, except instead of using synthetic foam, it’s made from all-natural latex. Latex is naturally occurring substance that comes from PLANTS, most commonly the Hevea brasiliensis, AKA the rubber tree (so it’s totally vegan friendly!). WHY LATEX IS BETTER THAN TRADITIONAL FOAM! As mentioned above, Latex is completely natural, meaning NO chemicals, no carcinogens (cancer-causing chemicals), and way less of an environmental impact than foam. Traditional FOAM mattresses that you may find from Tempurpedic, Casper, Purple, Lull, and EVEN Avocado (who advertises as natural latex - GREEN WASHING), are ALL made with synthetic blended materials that take YEARS to biodegrade, if ever! This is especially harmful to the environment since it is recommended that you replace these mattresses every 5-8 years! Not to mention, these brands are NOT organic or natural and contain carcinogens and dangerous off-gassing (read more about that HERE). 100% Latex Mattresses, on the other hand, are non-toxic. 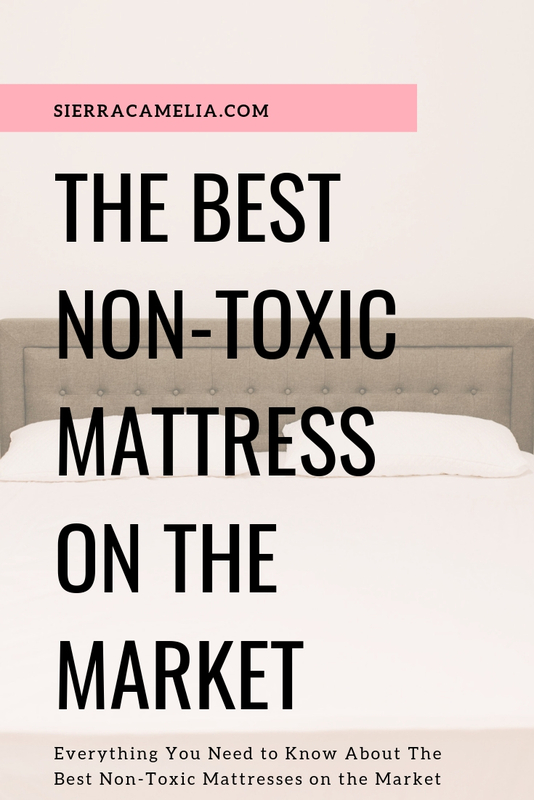 You don’t have to worry about breathing in formaldehyde and other carcinogens while you sleep! Since they’re made from naturally-occurring plant fibers, they are completely biodegradable when it comes time for a new mattress. Speaking of “getting a new mattress”, Latex mattress are MORE DURABLE than traditional foam mattresses which lose their firmness over time and begin to sink in. Latex fibers are more durable and won’t lose their shape as quickly as foam mattress will. On average, Latex mattresses last up to 20 years in great condition as opposed to the estimated 5-8 years for traditional mattresses. So far with Latex, you’re not only forgoing dangerous carcinogens, off-gassing, and needless waste, you’re also SAVING MONEY since you don’t have to buy a new mattress every 5-8 years. And the best part is, THEY COST EXACTLY THE SAME AS TRADITIONAL MATTRESSES! I’m still shocked that more people aren’t raving about Latex mattresses, but maybe my enthusiasm will make up for it (haha). After I spent weeks researching latex mattresses every single day (I’m not kidding guys, latex mattresses consumed my search history HAHA), I began to see a trend. That is, nearly EVERY SINGLE “LATEX” MATTRESS COMPANY WAS GREEN-WASHING, and weren’t TRULY 100% natural latex. I would even find companies that claimed “100% all natural latex foam”, but upon looking into them further, reading fine print, and looking HARD, I would find that the “100% natural latex” was only a top pad, and the rest of the mattress would be other synthetic, toxic fibers. I began to get discouraged - all these companies seemed to be lying and it seemed like there wasn’t a single HONEST company out there who ACTUALLY sold what they claimed to sell. And then I found them. SleepEZ. After weeks of searching brands, reading all the fine print and everything, I finally found a company who truly sold ORGANIC, 100% NATURAL LATEX MATTRESSES. Fully latex. Fully Natural. NO synthetic Materials. NO carcinogens. I wanted to cry in excitement - I FOUND THE BRAND. And in comparison to all the other brands I found who had a similar product, SLEEPEZ was the MOST affordable and MOST customizable. I did some more research on their brand just to be safe and I only found positive reviews and findings. It’s also been a family owned and operated company for years, and y’all know me, I love supporting a good family-owned business. SleepEZ is ACTUALLY All natural, organic, no sketchy chemicals, and environmentally friendly (as opposed to other brands who green-wash their product as this). SleepEZ is the most customizable fully latex mattress on the market. SleepEZ has an amazing 90-day guarantee policy where you can switch out any layers for better sleep - free of charge. I had my sights set on SleepEZ since October and decided to take a chance and reach out and just HOPE AND PRAY that they would be willing to partner with me, and to my pleasant surprise, they said YES. So I want to give a huge shout-out and thank you to SLEEPEZ for choosing me as their first influencer-partnership and sponsoring this blog post. It’s been such an honor to work with them! Picking a mattress when you live states away can be a little nerve-wrecking, but SleepEZ’s amazing customer service takes away all the concern! I was unsure of what kind of mattress I even wanted to try, so I called their customer-service line and spoke to a wonderful sales representative who spoke with me and helped me figure out the best mattress for my body-type, age, and how I sleep. They also have a 90-day return policy where you can switch out any layers of your mattress if you sleep on it and find it isn’t working for you! Not only were they extremely helpful in the ordering process, after I placed the order, they called me BACK and offered to upgrade certain aspects of my order since I had not specified. They were so considerate to reach back out to me to ensure I was 100% satisfied with my order! Setting up our latex mattress was SO easy. They come vacuum-sealed in several boxes depending on how many layers you purchase, and you simply open the back and allow the mattress layers to unfold natural. Simply place the layers on your bed frame in your desired order, cover with the supplied mattress-cover, and you’re good to go! If you want a video-tutorial, you can find that at the bottom of any SleepEZ page! I read various pros and cons online about Latex, and the number 1 CON that I found was the “bad rubber smell”. I was really nervous about testing this mattress out and bringing it into my home, honestly, because I’m weird about smells. I wasn’t exactly thrilled to sleep in what smelled like a TIRE SHOP, but hey, you win some and you lose some, so I took the chance. When we opened the box, I didn’t smell anything! We kept pulling the pieces out, and then eventually I got a slight whiff of what smelled like VANILLA CAKE. I was nervous about the smell this whole time, and it turns out we’re literally going to be sleeping on a giant piece of vanilla cake and I’m totally okay with that. In all seriousness, there was hardly any smell which was relieving. If the smell is concerning for you too, I’d confidently recommend SleepEZ because the smell is ever so slight and goes away within a few days! Before I wrote this blog post, I wanted to give our mattress the REAL TEST and actually sleep on it for more than a month so I could give you the most accurate review! Tim and I have been sleeping on our Organic Latex Mattress since the end of December, and I can confidently say I LOVE IT. I get the most pleasure from walking into our room and simply sitting on our bed because it’s so comfortable! On our previous “older” mattress, we would both wake up multiple times through the night due to being uncomfortable on our mattress, but now, we both sleep through the night. I also suffer from insomnia, so for me, having a comfortable mattress is SO SO important. We spend approximately a third of our entire life SLEEPING, so it’s crucial that we invest in that part of our lives as equally as we invest into our waking lives! Tim and I ordered the Select Sleep Organic, King Size mattress. Yes - 100% - go for it! If you need a new mattress, I would 10000% recommend SleepEz. Not only for their all-natural, non-toxic product, but for the comfort, for the price, for the customer service, for the brand’s ethics, for the whole package! The most popular Roma Queen Mattress is on sale using this link! 70% Shredded Latex Pillows - Limited Time Offer!